Vicky Shellabarger, 36, of Convoy, appeared in Allen County Common Pleas Court Wednesday morning to waive her constitutional right to a speedy trial. Judge Jeffery Reed set a trial date of March 26, 2019, for Shellabarber, who is charged with murder in the April death of her infant daughter at an apartment in Delphos. Vicky Shellabarger of Convoy talks with her attorney, Steve Chamberlain, during a hearing Wednesday in Allen County Common Pleas Court. Shellabarger, charged with murder in the April death of her infant daughter, waived her right to a speedy trial during the hearing. LIMA — A Van Wert County woman charged with murder in the death of her infant daughter earlier this year on Wednesday waived her constitutional right to a speedy trial. 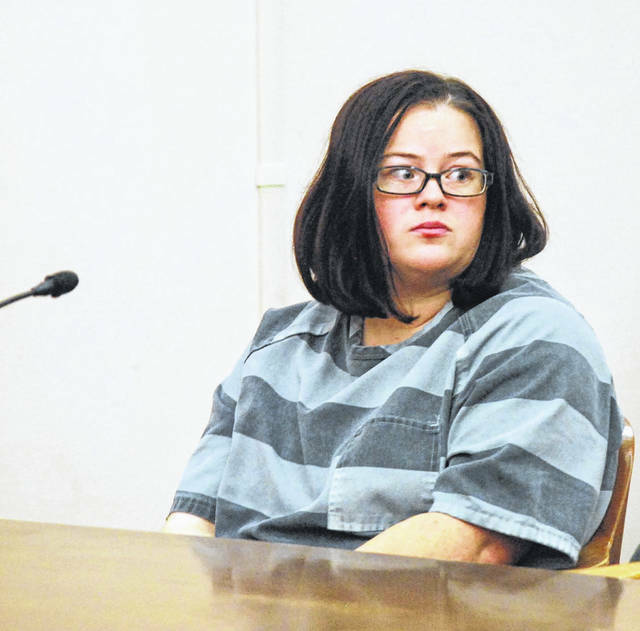 A tentative trial date of March 26, 2019, was scheduled for Vicky Lynn Shellabarger, 36, of Convoy, who was indicted in August an charges of murder, an unclassified felony; involuntary manslaughter, a first-degree felony; endangering children, a felony of the second degree, and a third-degree felony count of endangering children. The charges against Shellabarger are all linked to the death of her 22-month-old daughter, Madilylnn Shellabarger, who was found unresponsive in a Delphos apartment on April 29 and died later that day at a Lima hospital. According to initial reports from the Allen County Sheriff’s Office, first responders in Delphos were dispatched in the early morning hours of April 29 to an apartment at 218 N. Main St. in reference to an unresponsive child. The 911 call was placed by Vicky Shellabarger, the mother of 22-month-old Madilynn Shellabarger, authorities said. Upon their arrival, Delphos EMS personnel found the infant not breathing. She was transported to Mercy Health-St. Rita’s, where attempts to revive her were unsuccessful and she was pronounced dead. The death was initially described by Delphos Police Chief Mark Slate as suspicious. An investigation by the Allen County Sheriff’s Office, Delphos police and the Ohio Bureau of Criminal Investigation was conducted. Authorities ultimately said the child died as the result of blunt force trauma. The murder charge carries a mandatory prison sentence of 15 years to life upon conviction. Shellabarger is being held in the Allen County jail on $1 million bond awaiting trial. https://www.limaohio.com/wp-content/uploads/sites/54/2018/09/web1_Shellabarger-time-waiver.jpgVicky Shellabarger, 36, of Convoy, appeared in Allen County Common Pleas Court Wednesday morning to waive her constitutional right to a speedy trial. 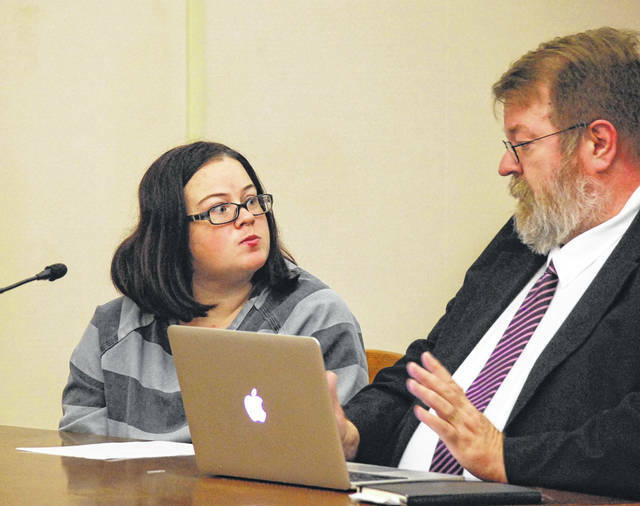 Judge Jeffery Reed set a trial date of March 26, 2019, for Shellabarber, who is charged with murder in the April death of her infant daughter at an apartment in Delphos. https://www.limaohio.com/wp-content/uploads/sites/54/2018/09/web1_shellabarger-time-waiver-2.jpgVicky Shellabarger of Convoy talks with her attorney, Steve Chamberlain, during a hearing Wednesday in Allen County Common Pleas Court. Shellabarger, charged with murder in the April death of her infant daughter, waived her right to a speedy trial during the hearing.